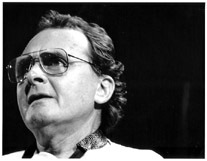 Stan Getz inBoston, MA,1989. A dear friend who had a tough life almost up to the end. He FINALLY was able to see the trouble he caused so many others. He died a gentleman and all is forgiven. A great talent.